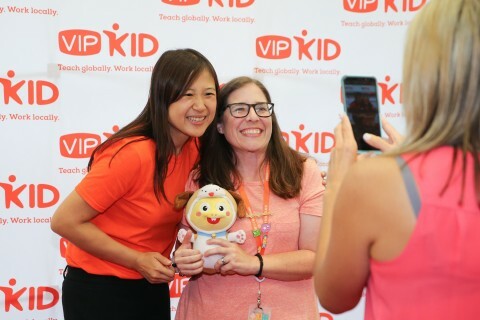 SAN MATEO, Calif.--(BUSINESS WIRE)--On August 8 at the George W. Bush Presidential Center over 300 teachers gathered at VIPKid’s regional conference, Journey, to hear from education leaders VIPKid Founder and CEO Cindy Mi and Former First Lady Mrs. Laura Bush. Dallas Mayor Mike Rawlings and education experts from SMU were also in attendance to celebrate and edify the teacher community. 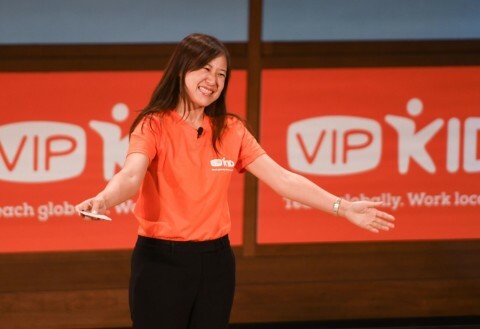 Cindy Mi spoke about VIPKid’s recently announced expansion to new international markets, curriculum additions and product lines that will serve children up to 18 years old. She highlighted that VIPKid teachers will now have the opportunity to teach more students at different ages and learning levels, reaching new students throughout the globe. Mi emphasized that VIPKid’s growth would not be possible without the skills and passion of teachers on the platform. “We have grown to over half a million students in 63 countries because of you … You are truly reaching children on a global scale,” Mi told the teachers in the audience. Mrs. Bush, a lifelong educator and prominent advocate for teachers, spoke about her passion for teaching and the importance of fostering a love of learning at a young age. “VIPKid teachers are the reason that VIPKid is thriving. And no matter what your reason is for becoming a VIPKid teacher, you are helping children learn and read. You are making a brighter future for kids around that world, and for that, I’m grateful … Thank you for your commitment to education,” Mrs. Bush told the audience. Dallas Mayor Mike Rawlings expressed his appreciation for the local teaching community and applauded their dedication to VIPKid’s mission of inspiring and empowering all children. “Not only are you making a difference in the lives of young children in many countries, but I believe you are creating a new economy and a new way for the world to come together,” he said. Texas is home to nearly 7,000 VIPKid teachers and yesterday’s Journey was VIPKid’s largest gathering of teachers yet. The first regional conference was held in Salt Lake City, UT in March 2018. VIPKid’s teacher community of over 60,000 teachers is one of the largest communities of online teachers in the world. VIPKid is a global education technology company that connects children with the world’s best teachers for real-time online English immersion learning. VIPKid’s mission is to inspire and empower every child for the future. VIPKid believes that education is not one-size-fits-all, rather all students are unique and the world is within their reach when connected with great teachers capable of personalizing learning and sparking curiosity. Founded in 2013 and formally launched in 2014, VIPKid has become China’s market-leading online education startup, attracting investment from Tencent, Sequoia Capital, Yunfeng Capital, Coatue Management, Matrix Partners, Sinovation Ventures, Learn Capital, Northern Light VC, Bryant Stibel, among others. The VIPKid platform currently connects over 500,000 paying students with over 60,000 teachers in the US and Canada. For more information, please visit: www.vipkid.com.